I wasn’t sure how I would begin this review. Should I start with the 16 year-old boy who holds the Crow mantle in this particular story? 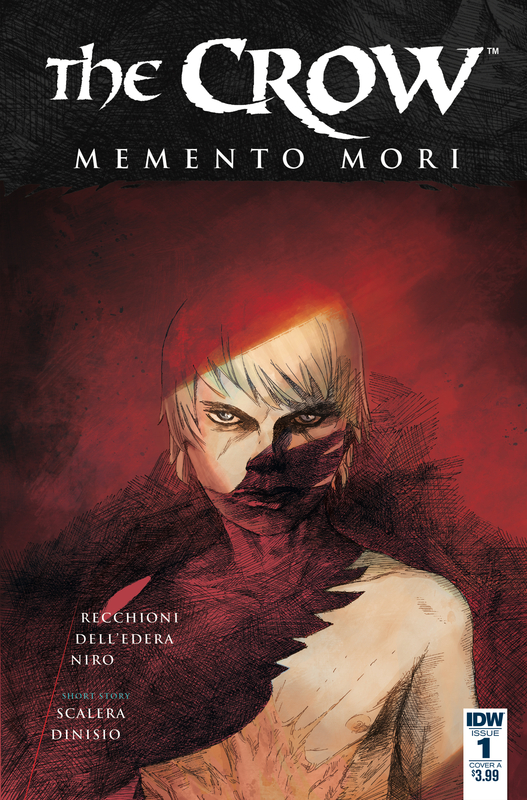 Memento Mori is also a good beginning/ending. It points out that we all must die and that it is all written. It’s a Latin thing. There’s my experience with the Crow subject matter itself. Let’s just say the Crow is vengeance beyond life. An alter boy is killed in a terrorist attack in Rome. His ties to god make this Crow story a much deeper connection to the faith. His vengeance is brutal. The Crow story has never shied away from violence when it believes it’s righting a wrong. Using God to further imply the righteousness gives the story an extra kick. The creators have done enough with the character design to make him different enough to bring in new readers and also keep the darkness alive with in the book. This first issue is a gripping beginning. It should be interesting to see where the story twists from there. The back up story by Matteo Scalera is beautiful. The page layouts are kinetic and dark. It’s gray washed tone imply this story is somber. The Crow legacy has had hits and misses over the year, but Memento Mori looks to be a hit after a great opening.